The power of mentors to influence ones' life is immense. As a young girl, my mentor was the sea. I was drawn to its wildness, even in the midst of an urban childhood, just south of Los Angeles. The ocean became my primary solace from city life and from my crazy family. Childhood, for me, was swimming into the ocean as far as I dared, past the large pounding waves, turning onto my back, my face to the sun, and floating the currents. I think I was completely unafraid. I know I was happy. And now in the middle of my life, I have had the great privilege of coming under the tutelage of Mardy Murie, and to live and work in one of the Murie's places of enchantment (as Olaus Murie called them), Moose, Wyoming. I live and work under the spell of her simple message: be happy, maintain honest relations, create a simple life, do good in the world and nurture a deep respect and affection for wild nature. My first connection to Mardy began when I brought students to Mardy's log cabin for lemonade and cookies and I watched the students melt under Mardy's influence. So many letters came back from students thanking me for letting them meet Mardy. Her favorite words of admonishment to these young people frequently appeared in these student letters: You are only half a person if you do not care. Six years ago I was hired to begin a center dedicated to carrying forward the Murie's legacy and their message of wilderness preservation, The Murie Center. For the first five years of the center's development, Mardy was our hostess and we shared the Murie ranch with her. We made visits to her regularly and they were always special. Her eyes would light up if we mentioned Olaus or Alaska. And her brow would furrow if we mentioned the Arctic National Wildlife Refuge with her concern about its future. I often thought that Mardy's tenacity and long life was connected to her amazing perseverance and the fact that the status of the refuge as wilderness was never secure. Many people continued to come and see Mardy right up to her death. They were folks from many, many walks of life who had discovered for themselves a profound connection to this woman. It didn't matter who they were, Mardy always welcomed them into her home. The owls gathered on the ranch, three days prior to her death on October 19th, 2003. She and Olaus had begun their courtship with Olaus calling in the owls for Mardy's benefit. She passed away two days before the 40th anniversary of Olaus' death, and on the same day that she and Olaus had always celebrated their wedding anniversary. It is a daunting task to create an institution that carries an entire lifetime of passion, conviction and wisdom. The Center is stepping into the opportunity with a commitment to continue Mardy's work. Mardy is gone but her energy and insistence on the value of wildness is present every day on the ranch. Our hope is that the Murie's ranch will continue to be a place where anyone can come under the influence of this great woman and the wonderful wild creatures that inhabit the land that she loved, so that together our voices for wildness will carry far and all our daughters and sons will inhabit an even more wild world than we do today. She met Olaus Murie, a biologist, in Fairbanks, and they married in 1924 in a 3 a.m. sunrise ceremony in the village of Anvik on the Yukon River. Olaus had been studying birds in Hooper Bay, and after the wedding, the couple spent their honeymoon traveling over 500 miles around the upper Koyukuk region by boat and dogsled conducting caribou research. Mardy's adventures growing up in Alaska and as a scientist's wife are chronicled in her book, "Two in the Far North," and in a documentary, "Arctic Dance." Published in 1962 and still in print, the book describes the winter night when she was 14 and Fairbanks caught fire, prompting her father and other men to burn the town's bacon supply as fuel to keep the steam-powered water pump running; her late-winter dogsled trips over thawing rivers; how she became the first woman to graduate from the Alaska Agricultural College and School of Mines; her marriage to Olaus; the couple's honeymoon, as well as a later river journey taken with their infant son, Martin, strapped to their boat. Additionally, Mardy authored "Island Between," published in 1977, and "Wapiti Wilderness," published in 1966 with her husband as co-author. Olaus was born on March 1, 1889, in the frontier community of Moorhead, Minnesota, and had also developed a close relationship to the land during his youth. The son of Norwegian immigrants, Olaus' later interest in natural history can be traced to his childhood along the Red River and its surrounding unbroken prairie. Olaus attended Pacific University in Oregon, where he completed studies in zoology and wildlife biology. After graduation in 1912, Olaus became an Oregon State conservation officer. Between 1914 and 1917, he participated in scientific explorations of Hudson Bay and Labrador, financed by the Carnegie Museum of Pittsburgh. 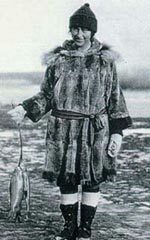 The Hudson Bay expeditions prepared Olaus for his job as a wildlife biologist with the U.S. Bureau of Biological Survey, now the U.S. Fish and Wildlife Service. Between 1920 and 1926, Olaus, joined by Mardy after their marriage, conducted an exhaustive study of Alaskan caribou, mapping migratory routes and estimating numbers. After that experience, the two agreed that theirs was a true partnership, and that Mardy would be at Olaus' side wherever his explorations took them. In 1927, the Survey assigned Olaus to comprehensively investigate the Jackson Hole elk herd resulting in the classic publication "The Elk of North America." He also authored six other major publications, including Alaska-Yukon Caribou (North American Fauna [NAF] No. 54, 1935); Food Habits of the Coyote in Jackson Hole, Wyoming (1935); Field Guide to Animal Tracts (1954); Fauna of the Aleutian Islands and Alaska Peninsula (NAF No. 61, 1959); Jackson Hole with a Naturalist (1963); Wapati Wilderness (with Mardy, 1966). Although the couple never returned to Alaska to live after their move to Wyoming, for the next two decades Mardy and Olaus made many trips into the wilderness of Alaska. In Jackson Hole, Mardy served on the school board and campaigned to support education and the local library. She and Olaus loved to dance, and they helped organize dances for teenagers. During World War II, Mardy did volunteer work, grew a victory garden and managed a dude ranch, while Olaus served as superintendent of the hospital and studied the "coyote problem" in Yellowstone. Olaus was a "tolerated maverick" in the Survey because he disagreed with its policy of eradicating predators. In 1937, Olaus accepted a council seat on the recently created Wilderness Society. Combining the logic of a scientist with the passion of an artist, Olaus proved persuasive in helping to enlarge existing national park boundaries and to create additional new units. Olaus' testimony on the unnatural boundaries of Olympic National Monument helped to convince President Franklin D. Roosevelt to add the great rain forests of the Bogachiel and Hoh River valleys. Olaus' vocal concern for a more ecological or natural boundary for the elk of the Grand Teton area helped to create Jackson Hole National Monument in 1943 and to achieve national park status a few years later. In 1945, Olaus resigned his position with the Survey and later went on to become president of The Wilderness Society in 1950. He was also a president of the Wildlife Society and a director of the Izaak Walton League of America. 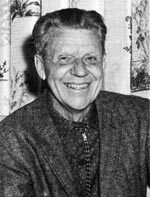 He received the Audubon Medal, the Audubon Society's highest award, in 1959 and the citation described Olaus as "the personification of the spirit of wilderness." Mardy also worked at various times for the Izaak Walton League and The Wilderness Society. In 1956, Mardy, Olaus and other field biologists traveled to the upper Sheenjek River on the south slope of the Brooks Range, inside what is now the Arctic National Wildlife Refuge. That trip began the campaign to protect the area as a wildlife refuge. The couple recruited former U.S. Supreme Court Justice William Douglas to help persuade President Eisenhower to set aside 8 million acres as the Arctic National Wildlife Range, which was expanded to 19 million acres and renamed in 1980. The idea of preserving an entire ecological system became the intellectual and scientific foundation for the creation of a new generation of large natural parks, especially those established by the Alaska National Interests Lands Conservation Act. By the time of his death on October 21, 1963, Olaus had earned a prominent position in the historical ranks of eminent American preservationists. Although he did not live to see the Wilderness Act passed, its enactment was in part attributable to his work and convictions. Mardy, however, attended the signing of the Act, by President Lyndon Johnson, in the Rose Garden of the White House on September 3, 1964. After her husband's death, Mardy began writing and took over much of her husband's conservation work. Their log cabin home in Moose, Wyoming, where Olaus had directed The Wilderness Society, became a center for anyone interested in the conservation movement. It was from that house in the woods, now the Murie Ranch that was declared a National Historic District in 1997, that Mardy began writing letters and articles, traveling to hearings and making speeches. She returned to Alaska to survey potential wilderness areas for the National Park Service and worked on the Alaska National Interest Lands Conservation Act that was signed by President Carter in 1980. That legislation set aside 104 million acres of land in Alaska and doubled the size of the Arctic National Wildlife Refuge. Her tireless efforts as a conservation advocate preserved some of the most important wilderness areas left on the planet. Mardy received a great many awards and honors, including the Audubon Medal in 1980, the John Muir Award in 1983, and the Robert Marshall Conservation Award in 1986. She was made an Honorary Park Ranger by the National Park Service and received an honorary Doctor of Humane Letters from the University of Alaska. In 1998 President Clinton awarded her the Presidential Medal of Freedom. Nearing her 100th birthday in 2002, Mardy was honored with the J.N. Ding Darling Conservationist of the Year Award, the National Wildlife Federation's highest honor. On October 19, 2003, Mardy died peacefully at her home in Moose at the age of 101. The Murie Center was created in 1997 as a non-profit dedicated to carrying on the work of the Murie family. For several years the center shared the Murie Ranch with Mardy, deeply appreciating her life long commitment to wilderness. With Mardy's passing on October 19, 2003, the center is now stepping into her role as a voice for wild places. The center broadens the conservation community by sharing the Murie story and place and strengthens conservation by connecting leadership to a personal land ethic. It perpetuates conservation by mentoring young adults to life choices that support wild lands and sustainable communities. The center uses a deeper, more personal form of communication in its work than is often found in public discourse. The Murie Conversation requires engagement of body, mind and imagination. The unique character of the conversations comes from the belief that to encourage a conservation ethic and convince people of the need to live with more respect for nature means one must pay attention to human attitudes, values, relationships and emotions. At the center, people set aside busy work schedules and reconnect with land and the spirit of place. There are many ways to participate in the center's work. The center publishes a yearly course catalog that lists workshops and retreats open to the general public. As a friend of the center, folks receive our yearly mailings and newsletters. The center has a bookstore of Murie books and videos. The center also partners with organizations to offer meetings, retreats, trainings and other activities that are suited to the simple accommodations on the rustic, historic Murie Ranch. Contact the center to schedule a program or meeting. Locally, the center runs the Teton Sustainability Project to engage the community in practical, Earth-sensitive lifestyle choices. It is the goal of The Murie Center to inspire the protection of wild lands and to encourage communities dedicated to harmonious living within the rest of nature. Visit The Murie Center website to learn more: http://www.muriecenter.org. Davis, Richard C., ed. (1983) Encyclopedia of American Forest and Conservation History New York: Free Press. Lavietes, Stuart (2003, October 23). 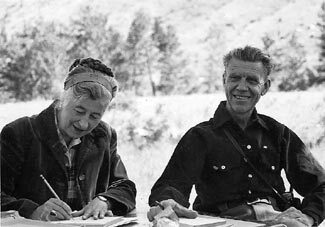 Margaret Murie, 101; Helped Save Wilderness. The New York Times. pp. C15. Life Magazine (1959). The Joys of Solitude and Nature: Naturalist finds fulfillment in Wilderness 47(26), December 28. Kendrick, Gregg. National Park Service: The First 75 Years. Biographical Vignettes. Olaus J. Murie. http://www.cr.nps.gov/history/online_books/sontag/murie.htm. Klinkenborg, Verlyn (2003, October 24). Margaret Murie's Vision. The New York Times. pp. A22. Manning, Elizabeth. (2003, October 21). Pioneer passes: Murie a champion of wilderness, conservation. Anchorage Daily News. http://www.adn.com/front/story/4214184p-4226213c.html. Murie, Margaret E. (1962, rev. edition, 1978). Two in the Far North. Stroud, Richard H., ed. (1984) National Leaders of American Conservation Washington D.C.: Smithsonian Institution Press. Other sources include the Jackson Hole Museum / Teton County Historical Center, Murie Center, Texas A&M, University of Alaska, and The Wilderness Society.